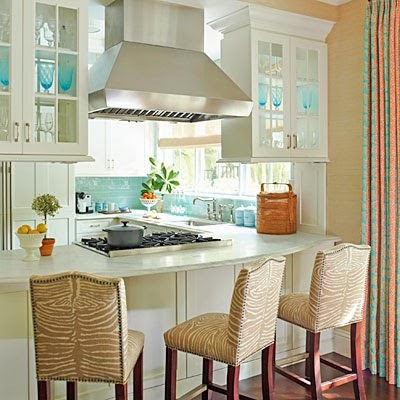 Designer Ashley Whittaker grew up in the coastal town of Gulf Stream, Florida, where pink houses and Lilly Pulitzer fabrics are de rigueur. 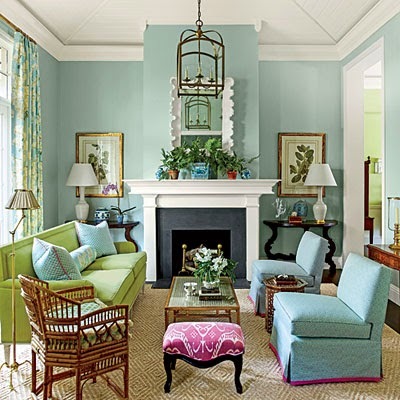 She cultivated an obsession with punchy, playful hues – evident in this British Colonial town house she decorated for family friends in her own hometown, and featured in the January issue of Southern Living. After spending 20 years building her design firm in Manhattan, Ashley was thrilled to revisit the sunny prints and patterns of her formative years. She also incorporated her eight decorating resolutions for the new year! “We wanted the home to feel bright and colorful like Florida but not like a vacation home,” said Ashley. Ashley incorporated a splashy pink in three places in the living room – the footstool, the contrasting pillow welt, and the slipper chair trim. The foyer features a multicultural mash-up, mixing old with new, and color with color. The dreary kitchen received a makeover with a few cosmetic fixes. The Brady Bunch-era cabinets were painted with Benjamin Moore’s Mountain Peak White and received nickel hardware. Dated surfaces were replaced with marble countertops and icy blue subway tiles. 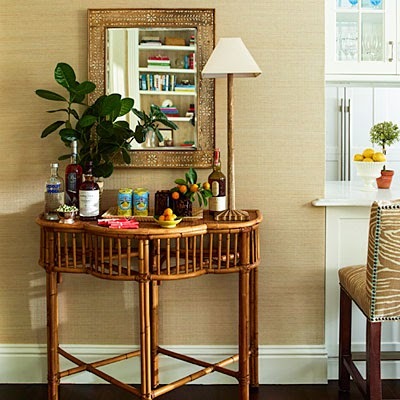 BONUS DESIGN TIP: This bamboo console, tucked next to the kitchen, serves as a bar. 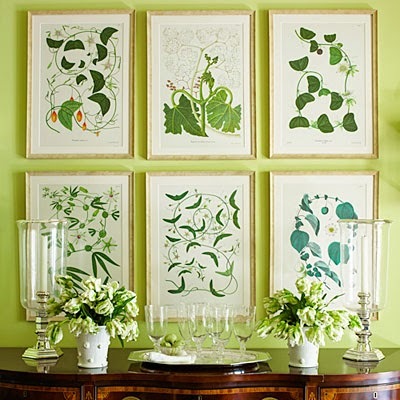 The lettuce green lacquered walls are kicked up a notch with bright coral upholstered chairs. BONUS DESIGN TIP: High sheens of the rich mahogany sideboard and table add contrast and polish to the sweet/tart color scheme of the dining room. In the family room, Ashley started with a base of natural texture by using grass cloth on the walls. The Belgian linen-covered sofa, soft ticking-stripe upholstered club chairs, and pale diamond-patterned rug create a neutral backdrop for the hints of bold coral red from the accent lamps and crane print. The dense pattern of this large-scale, blue-and-green flowering-tree motif wallpaper – Malabar Coast in Seafoam by Brunschwig & Fils – makes the large master bedroom feel snug. The crisp white headboard, lamps, and bedding give the eye a place to rest. 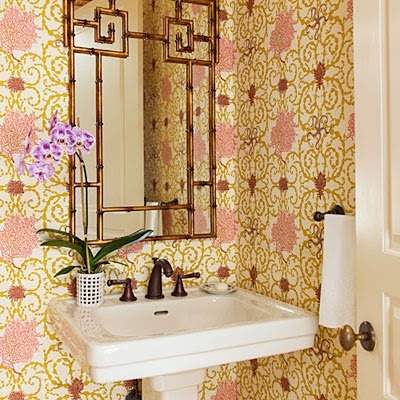 Ashley advises to think of powder rooms like jewel boxes. She clad the walls of this one with an intricate yet large-scale, coral-patterned wallcovering – Sea Scroll Kelp by Raoul Textiles. “It’s such a small space, so you can really get away with a lot of pattern,” she said. Just because it’s a workspace, that doesn’t mean the laundry room has to be plain and boring. 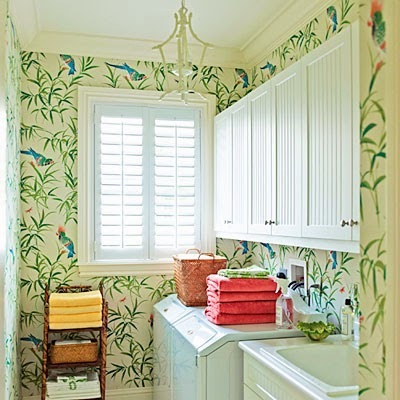 “You spend a lot of time in there, so why not make it pretty and fun?” said Ashley, who livened up this one with a pagoda-style lantern and a tropical-print wallpaper – Bamboo & Birds by Bob Collins and Sons – which is a classic Florida touch. Want to see more? Click here to read this feature in the latest issue of Southern Living, and for Ashley’s sources. You can also check out her amazing portfolio here, and follow her via Instagram here. And stay tuned as I will take you next inside a stunning Park Avenue duplex she designed! Wow, I love every room in that home. Her use of color is fearless. And she executes Florida style to perfection! I'm looking forward to seeing more of her work. Classic yet fresh design style. Love it! Checking out Ashley Whittaker's website now. Long time reader of your blog, first time commenter. 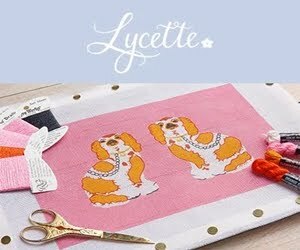 I always look forward to your posts – so much design inspiration! I love living in Palm Beach! Your posts remind me everyday how special it is. Happy New Year! I am in love with the laundry room, and those blue subway tiles! This is just gorgeous! I repinned every picture you pinned from this yesterday!!! So much inspiration for finishing my house. Happy New Year! Such cheerful, stylish and pretty interiors! I love Ashley's point of view and confidence!! Just the right dose of color and beauty to get me out of m winter rut! Thanks for sharing these Andrea! It would be impossible to feel blue in home decorated so bright and happy! 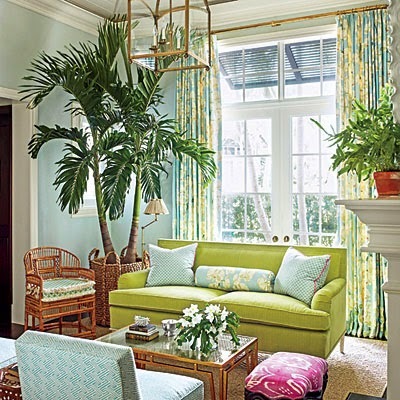 Such a cheerful fun Florida home, I love it!!! Love her!! I want every room in this post. I have been looking for a bamboo table like that forever. Great tips, too. what a great home…and I love her resolutions. My favorite is the make a big impact in a small space. I believe this wholeheartedly. I love Ashley Whittaker and this house is so much fun, but still so sophisticated! I need to remember those resolutions!!! I love all of her wallpaper selections AND salivate at all the bamboo. How kind of her to share tips!